T-Mobile and Univision announced Univision Mobile, a virtual pre-paid network operator with "services and features made to satisfy the needs of the U.S. Hispanic community". T-Mobile will provide the network backbone, while Univision will be giving customers access to "tailor-made content, events and apps". UM will launch its plans at around 1800 Walmart stores in the US. Additionally, the service will be available at 6000 independent dealers that serve Hispanic communities through the country. Customers are able to bring along their compatible devices by simply purchasing a SIM card, or they can choose from available devices. Customers with capable smartphones can also download the Univision Mobile application for access to additional content, rewards, and to track their minutes, text and data usage. NEW YORK, NY AND BELLEVUE, WA, May 15, 2014 – Univision Communications Inc. and T-Mobile US, Inc. (NYSE: TMUS) are joining forces to launch Univision Mobile, a pioneering wireless service created specifically for Hispanic Americans. The new service combines the insights and programming content of Univision, the leading media company serving Hispanic America, with T-Mobile’s wicked-fast network and Un-carrier™ wireless innovation and know-how. The new service will be available nationwide beginning May19th. Univision Mobile, with service provided by T-Mobile, promises affordable, flexible wireless service developed from the ground up to meet the unique needs of today’s Hispanic Americans. Anchored by the Univision Rewards program and portal, Univision Mobile also gives customers access to tailor-made content, events and apps – right out of the box, Univision Mobile customers are a click away from unique Univision content. With a population of nearly 56 million, Hispanic Americans are among America’s fastest growing groups. And, according to Nielsen, nearly three out of four Latinos own smartphones (72 percent), close to 10 percentage points higher than average in the United States. Moreover, a staggering 49 percent of Latinos say they plan to replace or upgrade smartphones within the next six months, based on findings from a recent Nielsen survey. Built on T-Mobile’s cutting-edge, data-strong network, Univision Mobile is uniquely suited to meet the needs of the highly connected, tech-savvy Hispanic American community – which has adopted smartphones at a much higher rate than any other group. As the exclusive national retailer, Walmart will offer Univision Mobile in approximately 1,800 of its stores throughout the country. The service will also be available at 6,000 independent dealer locations serving Hispanic communities throughout the country. Customers can bring along their own compatible devices by simply purchasing a SIM card, or they can choose from a wide array of available devices. Customers with capable smartphones can also download the Univision Mobile application for access to additional content and rewards and to track their minutes, text and data usage. Taxes & fees additional. $45 plan includes up to 2.5GB of 3G web, then slowed to 2G speeds for remainder of account cycle. Calls & text must originate on T-Mobile’s U.S. network. Portal & apps availability depends on selected plan. See UnivisionMobile.com for service, coverage & country lists. Univision Communications Inc. (UCI) is the leading media company serving Hispanic America. The Company, a leading content creator in the U.S., includes Univision Network, one of the top five networks in the U.S.regardless of language and the most-watched Spanish-language broadcast television network in the country reaching approximately 95% of U.S. Hispanic television households; UniMás, a leading Spanish-language broadcast television network reaching approximately 89% of U.S. Hispanic television households;Univision Cable Networks, including Galavisión, the country’s leading Spanish-language cable network, as well as Univision tlnovelas, a 24-hour cable network dedicated to novelas, Univision Deportes Network, a 24-hour cable network dedicated to sports, ForoTV, a 24-hour Spanish-language cable network dedicated to news, and an additional suite of cable offerings - De Película, DePelícula Clásico, Bandamax, Ritmoson and Telehit; Univision Television Group,which owns and/or operates 62 television stations in major U.S. Hispanic markets and Puerto Rico; Univision Radio, the leading Hispanic radio group which owns and/or operates 68 radio stations in 16 of the top 25 U.S. Hispanic markets and Puerto Rico, as well as Uforia, the leading Hispanic digital music service; UVideos, the first bilingual digital video network serving Hispanic America; an Interactive network of online and mobile apps and products including Univision.com, which continues to be the No. 1 most-visited Spanish-language website among U.S. online Hispanics, and Univision Partner Group, a specialized advertising and publisher network. UCI’s assets also include a minority stake in El Rey Network, a new 24-hourEnglish-language network founded by maverick filmmaker Robert Rodriguez, and a joint venture with Disney/ABC Television Network for Fusion, a news, pop culture and satire TV and digital network. Headquartered in New York City, UCI has television network operations in Miami and television and radio stations and sales offices in major cities throughout the United States. For more information, please visit Univision.net. As America's Un-carrier, T-Mobile US, Inc. (NYSE: "TMUS") is redefining the way consumers and businesses buy wireless services through leading product and service innovation. The company's advanced nationwide 4Gand expanding 4G LTE network delivers outstanding wireless experiences for customers who are unwilling to compromise on quality and value. Based in Bellevue, Wash., T-Mobile US provides services through its subsidiaries and operates its flagship brands, T-Mobile and MetroPCS. It currently serves approximately49.1 million wireless subscribers and provides products and services through70,000 points of distribution. For more information, please visit http://www.t-mobile.com. Why do people like you always have the assumption that all Latin American's are Mexican? Sounds like RadioShack No Contract. what about affordable plans for non hispanic? It's cheaper because it's deconted. 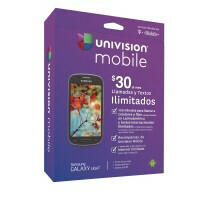 This Univision $45 plan may seem similar to the regular $50, but it isn't, because its speed is just 3G, not 4G. White people have had it waaay to good for too long. Sarcasm. Know what that means.....more frijoles in my pocket!!!!! You carry beans in your pockets?